Have Stocks and Property Reached a 'Permanent High' Again? Unlike last year which was a game of two halves, the first a near bear market as stocks were battered and bonds rallied and the second half, the reverse. There’s a strange feel to the end of this year, it is very calm. For the first time since the Global Financial Crisis, the major economic regions of the world are in synch, with the USA potentially seeing a further pick-up in economic growth in the final quarter, Europe surprising its skeptics with the strength of its recovery and Emerging Markets doing just fine with China managing to steer a course through its credit-fueled consumer-led economic transformation. So why no cheer? Why are bulls, those who strongly believe in US pre-eminence and market recovery, fretting? Valuations are stretched they will say. Are they what, map the run up in asset prices since 2009 to the real economy and its scary; Both European and US low grade Corporate bonds have swollen by over 200% meaning that new investors are not being paid for risk, the S&P 500 which tracks the five hundred biggest US Plcs is also up twofold and right across the world stock markets have advanced well over 100%. Meanwhile back at the ranch, real economic growth, despite vast choreographed and coordinated central bank stimuli in the form of ultra-cheap credit, widened money supply and quantitative easing, (buying unloved securities at prices no one will, lending to Governments and propping up long duration bonds in secondary markets) is, by comparison to asset prices, tiny. And there is no inflation. Plcs are showing little sign of margins coming under pressure from wage demands, despite near full employment in the USA and tightening labour markets elsewhere. Watchers are bemused, where is the inflation, they ask? Is it because of the dampening effect of good deflation, falling prices from advances in technology or is it because of slack, huge numbers of people in part-time employment competing for more hours? No one knows. But inflation is coming. It is inevitable. Bulls, casting their eyes over the run up since 2009 while thumbing through the history books, see only one bull market longer than this one and expect a cyclical recession to take hold in the US within the next few years, knocking the froth as they see it off this market. They predict low single digit growth of about 4% from a conventional mid-risk equity / bond mix over the years ahead, a slow and low world to persist without any major events. Typical cyclical recessions often triggered by raising interest rates to head off coming inflation, knock on average 20% of market prices and last six months, they will say reassuring nervous investors and themselves! Financial assets, like stocks have been bid up from the sheer weight of money competing for shares in companies, elevating current prices to historical top spots, but earnings per share which determines the quality of the momentum in profit growth, hasn’t kept pace with prices which means that what’s jacked up prices is demand not quality. But searching for yield, any kind of yield, when returns are negative for deposits and strong Government fixed interest bonds, has also pumped up many property markets. Australia whose top four banks have about 45% of their housing loans out on interest only and which hasn’t experienced a housing price reversal for over 50 years, looks like Krakatoa. Prices are now turning, leaving the Australian Reserve Bank in a trap if it wants to increase rates. Nearby, the New Zealand Government just banned foreigners buying houses. Its property market is also turning and its median house price vastly ahead of real wage growth. Canada is in a similar bind. Spare a thought for the Brits who are facing down the barrel of stagflation, economic growth reversing while living costs from dearer imports are rising. Last week the Bank of England raised interest rates in what seems to be a policy mistake, still sterling fell in price. None of these asset prices, whether financial or property can be sustained until and unless there is a super cycle of real wage growth for the middle classes, call it economic gravity. It is why the Trump Administration is desperate to deliver tax cuts, supply side measures which when coupled to diminishing red tape, have the potential to raise middle class prosperity, without which we return to the real underlying, structural problem -too much debt and not enough economic growth to sustain it. Extreme central bank policies, on the go now eight years, have become so normalized as to dim the memory as to why they were required in the first place. The policy response to the Dot.com burst was to drive interest rates to the floor and cut taxes, swapping the technology bubble during which earning profit had become a quaint notion, to a housing bubble as US consumers gorged themselves on cheap money and loose credit. At its height 10% of US consumer spending was writing cheques against the equity created by rising home prices and as we learned to our cost, many borrowers were self-certifying their income, populating high grade credit funds with NINJA mortgages, no income no assets. Has the extreme experiment with the elasticity of money and Keynesian economics, trying to print our way to growth, achieved anything other than swapping the last bubble for an ever greater global one? In the past ten years global debt has grown by 50%, hugely in excess of economic growth, to $215 trillion, much of it sustained by ultra-low borrowing rates. It is why all eyes are now on inflation indicators. Join the dots and raising interest rates, a policy requirement of central banks to ambush inflation at the pass, will fracture the weakest part of the new bubble, that could mean the vulnerable parts of the corporate debt markets, US Auto and Student loans and a range of property markets sustained artificially by cheap money and easy credit. A run up in US land, cotton and slave prices was followed by a raising of interest rates by the Bank of England which was financing US credit, over 1835-1842 the US market fell 56% in a bear market that lasted 82 months. It took over 21 years for peak prices to be recovered. A collapse in Viennese banks at the Centre of the Austro-Hungarian empire, after a sustained boom in Europe led by Germany after its technologically-driven victory in the Franco-Prussian War while Britain’s industrial might declined, was paralleled by a speculative post-Civil War boom in the US. It ended in the so-called long depression in large parts of Europe and the USA. From 1873 to 1877, the US market fell 47% over a 52 month period. 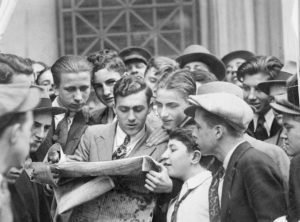 The Wall Street crash followed a super cycle of growth and cheap money elevating land and stock prices beyond the capacity of a weakening economy to bear, the result was a fall of 85% over 33 months followed by a short rally to 1937 then another precipitous fall of 57% over 62 months. Historians argue that significant policy mistakes sustained the Great Depression longer than necessary, informing much of the work of British economist John Maynard Keynes whose doctrines were dusted down and implemented with gusto this century. The so-called Dot.com crash bringing an end to a speculative bubble on the NASDAQ, where both profits and cash flow had been relegated to outdated concepts from the old economy, saw a fall of 78% over 2000 to 2002 and caused a general US market decline of 49% over 30 months. The Fed and Bush Administration response was Keynesian -slash interest rates and tax cuts but the medicine fueled the housing boom that ended in the Lehmann supernova. The US market fell 57% over 17 months before globally coordinated Central Bank money printing and interest rate cutting, restarted the run up again in asset prices. So here we are coming into Christmas 2017. If as I do, you determine that the structural issue of too much debt has not been adequately tackled by money printing and greater bank buffers, that there isn’t enough economic growth feeding through, then you will see that there is a race on. The contest is which will get here quicker, the next super cycle in economic growth triggered by technologies like AI driving productivity or a destiny with excess debt because wage growth has not kept pace with asset prices. It is why all eyes are on inflation. Previous PostTrial by On-Line Ordeal?